Thanks to everyone for the nominations. And thanks go to Anonymous and Hawerchuk for the link to the Super Bowl play-by-plays. Let's go in chronological order. Super Bowl 5. Dallas vs. Baltimore. Baltimore intercepted a Dallas pass with the score tied 13-13 with 1 minute left in the game and return s the ball to the Dallas 13. Baltimore went on to kick a FG to win. The interception took the colts from a 0.63 WP to a 0.91 WP, for a 0.28 WPA. Super Bowl 23. San Francisco vs. Cincinnati. With 1:17 left in the game, Joe Montana threw a 27-yard pass to Jerry Rice on 2nd and 20 from the CIN 47. SF went from a 0.37 WP to a 0.66 WP for a 0.29 WPA. Super Bowl 25. Buffalo vs. New York Giants. Down 20-19, Scott Norwood missed a 47-yard FG attempt to end the game. 47-yard FG's are made 67% of the time, taking the Bills from a 0.67 WP to a 0 WP for a -0.67 WPA. Super Bowl 34. Tennessee vs. St. Louis. Down 23-16, with 6 seconds remaining, Steve McNair threw to Kevin Dyson who was tackled just short of the potentially tying TD to end the game, taking the Titans from a 0.37 WP to zero for a -0.37 WPA. Super Bowl 36. New England vs. St. Louis. Down 3-0 in the 2nd quarter, Ty Law intercepted a Kurt Warner pass and returned it for a touchdown. The Patriots went from a 0.33 WP to a 0.59 WP for a 0.26 WPA. At the end of that same game, Adam Vinitieri made a game winning 47-yd FG as time expired. Before the kick NE had a 0.83 WP, and after they had a 1.00 WP, for a 0.17 WPA. Keep in mind that even if he had missed the game would still be tied at 17. Super Bowl 38. New England vs. Carolina. This game was truly an exciting 4th quarter shootout, and there were several plays that moved the needle by a fair amount. Trailing 22-21 with 4:28 in the 4th qtr, Tom Brady connected with David Givens for a 25-yd pass to the CAR 28 yd line. That took NE from a 0.50 WP to a 0.73 WP for a 0.23 WPA. Later on the same drive, with 3:30 left in the game, on 3rd and 9 Brady again threw to Givens for 18 yards to the CAR 3. This took NE from a 0.63 WP to a 0.88 WP for a 0.25 WPA. Down 28-22 with just under 2 minutes left, Jake Delhomme hit Ricky Proehl on a 1st and 10 play for a 31 yard gain to the NE 14. This took CAR from a 0.19 WP to a 0.38 WP for a 0.19 WPA. After the TD, CAR kicker John Kasay booted the kickoff out of bounds, giving NE excellent field position for their game-winning drive. A typical kickoff would give NE a 0.60 WP, but the penalty for kicking out of bounds gave NE a 0.67 WP, for a 0.07 WPA. Not much compared to some of the other plays, but still notable. Vinitieri again kicked the game winning FG with only seconds left, this time from 41 yards. Before the kick NE had a 0.88 WP, and after the kick it was 0.99, for a 0.11 WPA. Just like against the Rams, a miss would only mean a tie. Super Bowl 40. Pittsburgh vs. Seattle. Leading 14-10 with about 9 minutes to go in the game, PIT called a trick play on 1st and 10 from the SEA 43. A reverse hand off/WR pass from Antwaan Randle El to Hines Ward gave PIT an 11-point lead. The play took PIT from a 0.89 WP to a 0.98 WPA for a 0.09 WPA. Super Bowl 42. NY Giants vs. New England. On the famous go-ahead drive, Brandon Jacobs converted a 4th and 1 from the NYG 37 for a 0.21 WPA. The spectacular Manning-to-Tyree play was on 3rd and 5 from the NYG 44. It gave NYG a 1st down on the NE 25 for a 0.22 WPA. The TD pass to Plaxico Burress was actually the biggest play of the drive in terms of WP, worth 0.41 WPA. Super Bowl 45. Pittsburgh vs. Arizona. Another barn-burner. Down 10-7 with 18 seconds left in the first half, ARI was poised to take the lead with a 1st and goal from the PIT 1. Instead, James Harrison intercepted a Kurt Warner pass and returned the ball 99 yards for a TD. Before the play ARI had a 0.57 WP, but after the play it dropped to 0.20 WP, for a -0.37 WPA. In the 4th qtr, ARI trailed 20-16. With 2:53 left in the game on 2nd and 10 from the ARI 36, Warner hit Larry Fitzgerald for a 64-yard TD pass to take the lead. This took ARI's WP from 0.24 to 0.79 for a 0.54 WPA. Too bad this play won't be remembered. It was eclipsed by PIT's subsequent drive. With 1:02 left, PIT faced a 2nd and 6 from their own 46. Ben Roethlisberger threw to Santonio Holmes for a 40-yard gain, taking PIT's WP from 0.24 to 0.74 for a 0.50 WPA. Then with 42 seconds left, Roethlisberger hit Holmes again, this time on 2nd and goal for a 6-yard TD pass that took the lead for good. This play took PIT's WP from 0.58 to 0.96 for a 0.38 WPA. Super Bowl 43. New Orleans vs. Indianapolis. The Tracy Porter interception return for a TD with 3:24 left in the game give NO a permanent 14-point lead took them from a 0.77 WP to a 0.98 WP, for a 0.21 WPA. The Bills' missed FG in Super Bowl 25 vs. the Giants turns out to be the most decisive play in Super Bowl history with a -0.67 WPA. But Super Bowl 38 and 42 were the two most exciting games, each with multiple lead changes last in the game. Martin made a great point in his comment on the previous post: What if Eli Manning had been sacked and the throw to Tyree never happened? Had Manning been sacked, it would have brought up a 4th down and 12 from the NYG 37 with about 1 minute remaining. NYG would have gone for it, which would put them at 0.07 WP. The successful Tyree catch put NYG at 0.46 WP. So if you look at the difference between the virtually certain sack and the actual outcome, the WPA could be considered as high as 0.39. It's much higher than the 0.22 WPA between the snap and whistle, but still short of the WPA of some of the other big Super Bowl plays. One thing I learned doing this exercise is that we've been lucky as fans. The last decade or so has truly been the era of the exciting Super Bowl. "With 2:53 left in the game on 2nd and 10 from the ARI 26, Warner hit Larry Fitzgerald for a 60-yard TD pass to take the lead." Fitzgerald is So good, he only has to get to the 14 yard line to score. "Super Bowl 5. Dallas vs. Baltimore. Baltimore intercepted a Dallas pass with the score tied 13-13 with 1 minute left in the game and return s the ball to the Dallas 13. Baltimore went on to kick a FG to win. The interception took the colts from a 0.63 WP to a 0.91 WP, for a 0.28 WPA." Actually they returned it to the Dallas 28, according to PFR and Wikipedia. From there, two runs gained 3 yards, putting the ball at the Dallas 25. The FG was 32 yards, which adds up right for 1970 style kicking. Brian, very interesting stuff as usual. For most examples, you give the WPA as the difference between WP before the play and after. But for Kasay's kick out of bounds, you give it as the difference between a typical kick and what actually happened - why? Is the 0.6 the average for all kickoffs (i.e. including muffs and returns for TD, etc.) or the WP from starting on offense at the typical yardline? Also, in the same game, it must have been "Down 29-22 with just under 2 minutes left, Jake Delhomme..." That way the score would be tied after the XP and Vinatieri's kick would be to decide between a tie and the win, as you said. The "Notice that even with the lead, CAR would not be favored to win" should be removed. Is there a way to control some of the older ones to exclude present-day percentages? For instance: "Super Bowl 25. Buffalo vs. New York Giants. Down 20-19, Scott Norwood missed a 47-yard FG attempt to end the game. 47-yard FG's are made 67% of the time, taking the Bills from a 0.67 WP to a 0 WP for a -0.67 WPA." Were 47yd FGs made 67% twenty years ago? Maybe overly stats-y, but maybe you could look at the change in odds rather than probability. It's a lot harder to move some distance at the high and low ends than to move the same distance in the middle of the range. Plays like Porter's interception and the Randle El reverse-pass would get a lot more credit. With adjusting the FG% for era, I'm not sure if that's fair to other plays. The WPA model used on this site is from play by play data from this decade. If we had the PBP data from a different era, it would create different numbers. Ideally, we would have the PBP from the Super Bowl era, and could apply a WPA model to all of it to come up with more accurate numbers for all of this, but right now we don't. I'm not sure if it's fair to adjust field goals for era but not everything else. I would think in these situations it would be good to compare all of these to the alternative(A pass for a TD vs an incompletion, a field goal made vs a field goal missed). I was going to make the same comment as Alex -- subtracting probabilities is rarely the right thing to do (as the result is not a probability, and in fact has no good meaning at all). The Odds Ratio is the right sort of comparison -- rather than using WPA, you should use IOW (Improvement in Odds of Winning). Have to figure out to deal with the endpoints, though -- Odds Ratio breaks down where P=1 (after the game is over). Thanks for the corrections. I was in a rush to put out the post before I left for a trip. It was unexpectedly time consuming. The reason I like using probability instead of changes in odds ratios is because of simplicity. I think of it this way: Say a team has a 0.20 WP given the current game state. That means that for every 100 potential futures, they'd win 20 of them. If a big play takes them to 0.40 WP for a +0.20 WPA, that means they now have 40 chances out of every 100 possible futures. The play basically added 20 chances out of 100. Further, probability is a linear utility. If winning the game is my ultimate goal, WP is a purely linear and transitive utility function. For example, a 0.40 WP is exactly twice "as good" as a 0.20 WP, and exactly four times better than a 0.10 WP. This is critical for decision analysis, such as 4th downs, run/pass equilibrium, onside kicks, etc. Decision theory and game theory rely on a linear utility function, and WP provides that. Also, yes, I complete agree that the WP model for this era probably would not quite fit previous eras for several reasons. As I wrote in the preceding post, it's still a fun exercise, and the differences may be fairly small (except for FG rates). I agree that even though the WP model is probably different in the 60's, I can see how doing this is fun and worth a look at. With the WP model, I'm guessing if you go even further back before the Super Bowl era, that is when the biggest changes would occur. I'm guessing we may never be able to collect enough play by play data from back then, but we can still try. Brian - I understand your point, but I have to disagree. When comparing two probabilities, your point makes it so that we have to say any improvement of 20% is better than any improvement of 10%. But if a play moves me from 90% to 100%, not only is it impossible for the play to do any better, it also just guaranteed me victory. What could be better than that? A play that takes me from .79 to 1.00. WPA is a retrospective measure of the change in fortune rather than a measure of how 'good' or improbable a play was. WPA is a narrative stat, so it is partially dependent on previous events. For that, EPA (Expected Points Added) would be the appropriate stat. It measures the change in net point potential. If we wanted to, we could just as easily crunch the numbers to see the biggest plays in terms of EPA in Super Bowl history. But I almost guarantee it would be the James Harrison interception return. Would a play that takes you from .1 to .31 also be better? I'd take the .9 to 1, and I think it's hard to argue for the former. Alex - it depends on what the other options are. If 'failure' in the 0.9 WPA play results in a WPA of 0.89 then I wouldn't be overly fussed if I didn't get the win on that one play. If failure of the 0.1 WPA play resulted in 0 WPA then I'd definitely want success in that play over success in the 0.9 WPA play. In both cases a successful kick is worth 0.25 WPA, but if you could only choose one of the kicks to be successful, you'd take the one in game A because a miss is worth -0.75 WPA. These are relatively simple situations and so can be easily compared but they still show that "what didn't happen" is just as crucial as "what did happen" in determining the biggest plays. Wow. 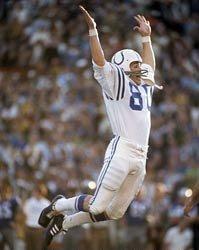 Scott Norwood was only a few feet away from being everything Adam Vinatieri was later reputed to be, at least in terms of WPA. I remember back in February you did a WPA analysis of the Super Bowl MVP, confirming Brees's selection. I wonder, if there's still some time left in the off-season doldrums, or just to keep in the back of your head for the bye week before the Super Bowl, if you could extend this to historical Super Bowl MVPs, especially the 10 or so that have been determined by fan voting, such as Brady over Law in XXXVI. I'm nitpicking here, but the Pittsburgh vs Arizona game was Super Bowl 43 and the New Orleans-Indianapolis game was Super Bowl 44. Not 45 and 43, as you mentioned. I dont care where i get my WPA. if i go from .8 to 1 or .1 to .3; i am completely indifferent! remember, with a .8 WP you will most likely win anyway. in fact, if you do nothing special from this point out you will most likely come out with a victory. also, i think maybe there is some confusion (or human bias) against the lower number....i would rather go from .8 to 1 instead of .1 to .3 because i would rather find myself in the .8 WP situation to begin with instead of the .1 WP. But that isn't your choice, you are stuck at that moment in time, and your job is to increase your winning probability as much as possible. PIT was down by 3. Teams usually become overwhelmingly conservative in that situation and are willing to settle for the tie.